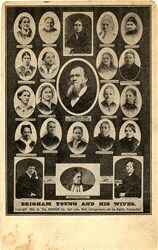 Beautiful postcard of Brigham Young and His Wives dated in 1909. This item is over 100 years old. This item would look terrific framed.